As the US faces its worst financial crisis since the Great Depression of the 1930s, the American financial and economic leadrship has come under severe criticism by the world. Last week -- even before Wall Street's latest collapse -- 13 former finance ministers met at the University of Virginia campus and called on the Americans to fix their 'broken financial system.' Australia's Peter Costello noted that lately the US has been "exporting instability" in world markets, and Yashwant Sinha, former finance minister of India, concluded, "The time has come. The U.S. should accept some monitoring by the IMF." The Wall Street Journal reports that the turmoil in the U.S. financial sector is rippling through political debates around the world, giving ammunition to foreign officials who question American economic leadership and oppose policies that follow the U.S. model. While the U.S. has been a model for Chinese reforms, now it's clear "the teachers have their own problems," says Song Guoqing, an economist at Peking University's China Center for Economic Research. Former Malaysian prime minister Mahathir Mohamad has criticized the U.S.'s handling of the financial crunch on his Web site. "I remember well how we were told never to bail out failing companies," he wrote in his blog on Sept. 18. "But in the last one year the Fed has bailed out dozens of failing banks, mortgage corporations and other businesses." Clearly, this crisis has presented a rare opportunity to the critics of the American economic leadership around the world, especially those who have had to listen to lectures from American officials or accept the IMF-prescribed bitter medicines as cure for their economic ills. In spite of the harsh and overt criticism by these ministers and economists, the fact remains that their own nations have been emulating the US financial system and their banks have been full participants in it. What drives the financial markets of the world today are the basic human emotions of fear an greed. "Greed is good", said Gordon Gekko, a fictional character from the 1987 film "Wall Street". Gekko is based loosely on arbitrageur Ivan Boesky, who gave a speech on greed at the University of California, Berkeley in 1986 and real-life activist investor / corporate raider Carl Icahn. A number of prominent Wall Street figures, including Ivan Boesky, were found guilty of criminal behavior and convicted in the 1980s. Fear and greed. These are the two main human emotions that primarily drive the world of finance and investing. Sanity prevails when fear and greed are in a state of near equilibrium. Things go badly out of kilter when one of these emotions significantly dominates investors and finance executives behavior. The years of extraordinary greed, unhindered by regulators, produced massive hedge funds, rampant speculation and AAA and AA rated questionable mortgage-backed securities and other new-fangled financial instruments such as CDSs (credit default swaps) with shaky foundations that brought enormous profits to the investment banks on Wall Street. Now, overwhelming fear is driving the big Wall Street firms into bankruptcy and the US economy toward a prolonged and deep recession. The fear is so great that the investors around the world have grown increasingly nervous and stormed into the safest investment around -- short-term Treasury Bills issued by the US government. 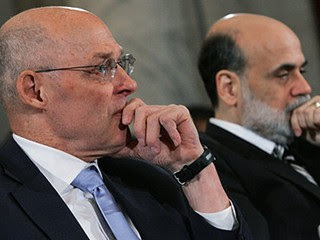 The behind-the-scenes nightmare scenario for US economy, painted by Treasury Secretary Henry Paulson and Fed Chairman Ben Bernanke, has scared the recalcitrant US Congress into agreeing to a massive $700b bailout of Wall Street. This large sum amounts to $2,333.33 for each American. On Tuesday, in his testimony before the US Congress, Bernanke said "Despite the efforts of the Federal Reserve, the Treasury, and other agencies, global financial markets remain under extraordinary stress". "Action by Congress is urgently required to stabilize the situation and avert what could otherwise be very serious consequences for our financial markets and our economy", he said further. "We must do so in order to avoid a continuing series of financial institution failures and frozen credit markets that threaten the well-being of American families' financial well-being, the viability of businesses both small and large and the very health of our economy," Paulson said. As the criticism of the bailout plan on the Main Street mounts, the markets around the world are taking huge sigh of relief, confirming the pre-eminent status of the US as the epicenter of the world economy. Meanwhile, there are reports of a compromise deal in US Congress that will dole out $250b immediately, followed by a second tranche of $100b in a few months, after review by Congress. The remaining $350b is not committed but it will be considered in the future, based on the progress made by the US Treasury. According to media reports, the plan would allow the government to buy bad mortgages and other troubled assets held by the banks and financial institutions at risk. Getting those debts off their books should bolster their balance sheets, making them more inclined to lend and easing one of the biggest choke points in the credit crisis. If the plan works, it should help lift a major weight off the sputtering economy. There reports also indicate that there will be strong Congressional oversight, new regulations, limits on executive compensation and the government will get warrants that can be converted to common stock of the Wall Street firms which accept the government's bailout offer. As the White House and Congressional leadership try to hammer out a bailout plan, the FBI is reportedly investigating market manipulation charges against a number of leading traders and short sellers. It is alleged that speculators started and spread false rumors about many Wall Street firms to profit from the precipitous decline and collapse of Bear Stearns, Lehman Brothers and other financial institutions. The last few days have severely tested the abilities of Secretary Paulson and Chairman Bernanke as crisis managers. Both have spent long days and sleepless nights working on their bailout plan and convincing President Bush, congressional leadership, and presidential hopefuls Barack Obama and John McCain to come together in supporting their plan with a great sense of urgency. They seem to be succeeding in spite of the bitterly contested US elections only about 40 days away. The key leaders and presidential candidates have met today at the White House and agreed to expedite the passage of the plan. There are still many critics and many unanswered questions about the plan. The most common criticism is based on the concern, known as "moral hazard", that the bailout will encourage more reckless behavior by market participants if they do not bear the full consequences of their actions. Some, particularly conservative Republicans, are ideologically opposed to government intervention in capital markets. They consider any government-led bailout as "socialism" or even "communism". Others are proposing some form of government backed insurance plan for the troubled mortgage-backed securities rather than outright purchase by the US Treasury. However, there is broad consensus emerging that the price of inaction would be far greater than the cost of the proposed plan to the American taxpayers. It is clear that decisive action is needed by the US to stabilize the world markets and reduce the chances of a deep, worldwide recession that will likely take its biggest toll on the most vulnerable people around the world. While the deal appears close, it could still fall apart due to political rancor and powerful Republican opposition led by Sen Richard Shelby, the ranking Republican on the Senate Banking Committee. Labels: Bernanke, Fear, Greed, Paulson, US Economy, Wall St.
actually its not that ironic. in the 1930's when the great crash happened they put stiff oversight on regular banks to prevent what we call a bank run, where we withdraw all our money at the same time. this moronic policy of little government insight began with the crash of the 1900's. so in the great crash we began regulating personal banks and they ignored the large investment firms. the theory was in way almost like an ayn rand novel. where by letting the smartest of us, keep more of their money and it'll eventually trickle down to us. this mindset is responsible for the savings and loan crash of the 80's. thats where they got the idea of a buy out in the 80's a firm was established to buy up all the bad debt and it worked at least in the short term. now heres the ironic part, that money never trickled down. so all this proves a dramatic debate that has been argued over for at least a hundred years. nothing so large scale has ever occured. for some of us in this country, this is a victory. you see its always the people that pay for the sins of their government. whether its economic or political. we will bear the weight because the side of our country that promoted this system just so happens to be the same side who believe in waging a war on terror. so that's what we as Americans see as ironic a hundred year argument finally coming to an end.